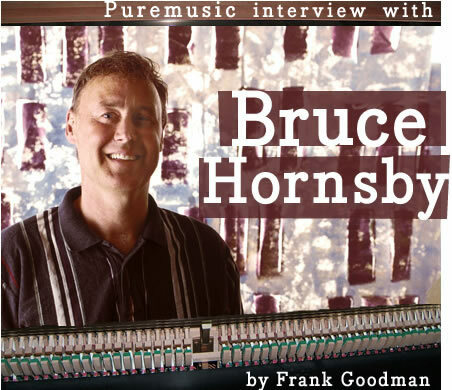 Bruce Hornsby is certainly an artist who requires no introduction. What may require introduction about him, since he is largely viewed as a pop artist, is the depth of his musicality, and the unprecedented genre hopping he has achieved in his still blossoming career. We have a good friend in common, the great guitarist Steve Kimock, who played a lot of dates with Bruce, and appears on disc Four on a tune called "The Chill." So that helped us get on to a special level of conversation in an interview that for us is rather short, because his hard working publicist Renee Pfefer was moving him on to his next interview, of course. But in our time we had a very good talk; he's an amazing person and a musician who knows no equal in terms of the breadth of his collaboration across many genres of modern music. I once saw him on stage, rehearsing for an Earl Scruggs extravaganza at The Ryman; a buddy and I happened to be in the audience up front, just watching people get it together. Bruce was sitting at the piano playing when mandolin wizard Chris Thiele from Nickel Creek jumped onstage. They hit the ground running like two jocks with a basketball, and ran through so many tunes in 15-20 minutes, just laughing and playing their asses off. My friend and I just shook our heads and laughed afterwards walking out, there were no words to describe what we'd just seen and heard. It was like seeing Django Reinhardt and Stephane Grappelli running into each other at a bar in the wee hours. In an age of so much prepackaged music that is not nourishing, I feel very lucky to have people like Hornsby around to remind me what it's all about. We urge you to pick up Intersections for at least 53 reasons, and hope you enjoy our conversation with the self-effacing and engaging genius from Virginia.